← Ontime Everytime is a Wonderful Thing!! This phone was supposed to be the email flagship from Nokia. Well, I tried. 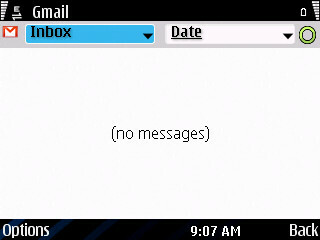 Nokia Messaging Email is just so unreliable for me. I am just not sure whether it’s working, it’s not working, what? Then there is that two weeks cap on inbox, sent items etc. You can’t have email of longer than 2 weeks duration in the mobile client. This is absolutely weird! I have been using Profimail ( an email client from Lonely Cat Games). It’s not that I have started Profimail recently or something. I bought my license in 2007 on my Nokia N82. I know it’s not UI friendly. It’s no eye candy. It’s no this. It’s no that. But at the end of the day, it works! It simply works for me. That √ sign against each of the mailboxes is so reassuring. It lets me access my age old mails; it lets me use my memory card as storage (so unlike Nokia Messaging which forces us to use Phone memory, thereby rapidly decreasing your MBs). I do not need to open my mail. I can split the screen where the preview of the mail can be seen at the bottom half. You can scroll through it and then decide whether to open, act, flag it for later action or simply ignore. On this phone itself, it’s been almost two years now since I have been using this service. I never thought I would write about it. Two reasons: 1. This is quite an old client about which people would have written about so long back that you wouldn’t even remember any review, I presume!  2. People are moving onto other platforms. Android in particular is gobbling up Symbian markets so fast that I wondered if it would make any sense to write about a Symbian mail client. Then Why I am writing it? Again two reasons: 1. 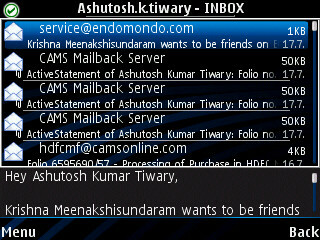 To me, even after all these years, there are few better email clients than this for Symbian. 2. This has been the only client which has worked without worries for me. I tried Mobile Documents. Honestly, wonderful client but sometimes just gets stuck at fetching emails for me. I still get 15-20 mails per day. Personal emails I am talking about, not work, not mailers, not notifications of some service. If you are one of those few still on Symbian, if email still plays a part in your life, if UX matters over UI for you, do give it a shot! I am a user who had much better experience with E-series (E52,E72) email client than on any other Nokia devices.I agree 2 weeks is limitation. But speed of delivery, HTML view, Mail for Exchange just worked well. May be I am more of Mail for Exchange(Part of Eseries email client now) user, and it works very well with push email, calendar,contacts ,to-dos. Very well integrated in phone. Having said that Email(non MfE) on recent S^3 device is below average(delivery and sync status). DUMP THAT E72 RIGHT NOW I SAY!!!!!!!!!!!!!!!! !